Fall has arrived! It&apos;s not only the perfect season to visit Mesa, it&apos;s the perfect time of year for locals to get outside for a family fun day or date night. From art shows to movies and spooky celebrations, festivals are lurking and deals are brewing in Mesa as we approach the new season! This free event on Oct. 20 from 5 – 9 p.m. features bounce houses, live music, carnival rides, and other entertainment. Admission to the festival is free, and food trucks from local vendors will be on site. This family event focuses on bringing the community together and celebrating Mesa. 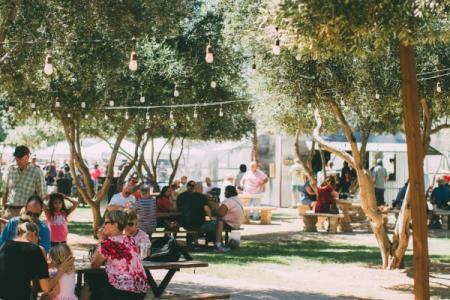 Get your garlic fill at the huge, FREE two-day event at the Queen Creek Olive Mill! Organically grown estate garlic from their garden will be sold Saturday, Sept. 29, and Sunday, Sept. 30 at the festival. On top of that, you can enjoy live music, Valley food trucks, a beer and wine garden, cooking demos, garlic gelato, games, tours and more! This family-friendly event is unique and the newest staple at this Fresh Foodie Trail location. Don’t worry, breath mints will be provided! Formerly known as the Mesa Arts & Crafts Festival, this FREE event in Downtown Mesa features unique artist creations, music and more! Take advantage of the good weather this season by strolling through Downtown and enjoying the artists and vendors, or even purchasing an irreplaceable piece for yourself! The fall dates for the festival are Oct. 6 & 20 and Nov. 3, 17 & 22, so don’t miss out! Visit our events calendar for full list of festival dates for the 2017 – 2018 season. Get ready for a spooktacular time in Downtown Mesa! Little ghouls and goblins, princesses and superheroes, mummies and vampires and more can walk down Main Street and stop at participating businesses for a candy or treat surprise on Wednesday, Oct. 31 from 11 a.m. – 2 p.m. You can also enjoy games, face painting and activities in Downtown Mesa’s D-Lab, a pedestrian-friendly ally, if you need a break from trick-or-treating. 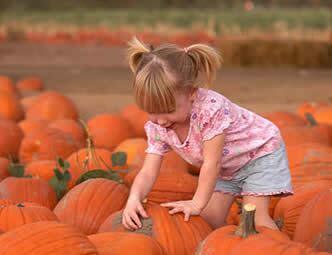 This FREE and safe event is perfect for families and Halloween fans of all ages! Music is in the air this fall! Every Thursday from Nov. 8 – Dec. 13, enjoy FREE afternoon concerts in the Wells Fargo Garden performance area on the Shadow Walk at the Mesa Arts Center. Concerts begin at 12:30 p.m. and attendees are encouraged to bring their own comfortable folding chairs or blankets. Every week is a different sound, and lunch, drink and dessert selections will be available for purchase. 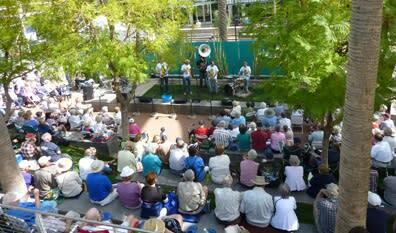 You can also opt to bring your own picnic lunch at this season’s Out-to-Lunch Concert Series in Mesa. ‘You bring the blankets and we’ll supply the popcorn’ at the fall season’s select Ride-in Movie dates. Movie-goers are encouraged to ride their bicycles or walk to Monterey Park on Sept. 24 for a viewing of Tangled Ever After, and Carriage Lane Park on Oct. 15 to watch Goosebumps. This FREE, family-friendly outdoor event is hosted by the City of Mesa’s Bike & Pedestrian Program and SRP. Well-behaved pets are welcome, and attendees are encouraged to bring lawn chairs, blankets and picnics to the showings. Don’t forget your helmets and bike lights! 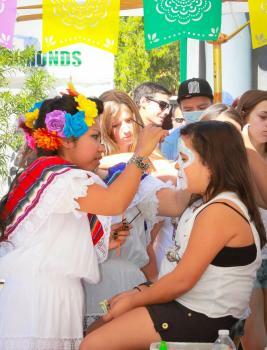 Enjoy a variety of food, a colorful Mercado featuring local vendors, and live entertainment at the Dia de los Muertos Festival at the Mesa Arts Center Oct. 27 – 28. At this FREE event, join the community in celebrating and remembering those who have passed on during the traditional Mexican holiday. Embrace this cultural event and rejoice loved ones at the festival where spirits connect in Downtown Mesa this season! Visit our blog to find out more about this festival and to explore local food destinations from south of the border.